A sense of place is the single most important factor when crafting a high quality wine. The French call it terroir, which is that certain something that exists because of the unique and irreproducible combination of climate, soil, rainfall, grape type and other critical factors that exist in a very specific place. When Al Scheid of Scheid Family Wines first planted grapes in Monterey County in 1972, he believed he had found a truly special place. And when Kathie Lee Gifford decided that she wanted to craft a wine, she looked to Monterey as that perfect intersection of ultra-premium quality and affordability. 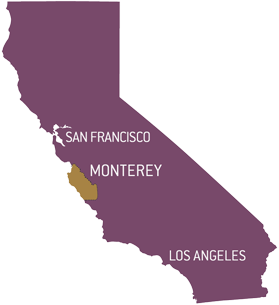 As a wine grape growing region, Monterey County is known for its long growing season. Wine grapes are harvested once each year – in warmer regions, this generally occurs over the months of July through September. In Monterey, we harvest from September through the beginning part of November, giving the grapes what we call extra “hang-time”. This additional time on the vine results in wines that exhibit intense fruit flavors, deep color extraction, and full varietal expression. How is extra hang-time possible? The close proximity of Monterey Bay’s cold deep waters causes chilled marine air from the Monterey Bay to be pulled down the Salinas Valley each day. Evening coastal fogs in the spring and summer blanket the vineyards and often linger until mid-morning the following day. This natural cooling effect slows down photosynthesis, allowing the grapes to ripen more slowly and evenly. 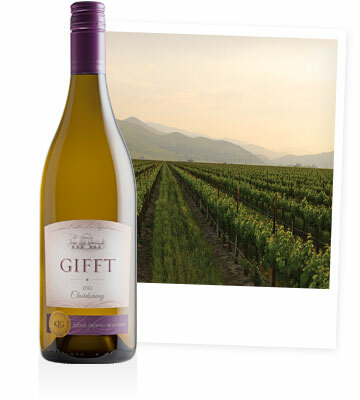 GIFFT Estate Grown Chardonnay is sourced from the cool climate estate vineyards of Scheid Family Wines in northern Monterey County, located just outside the town of Greenfield. With morning fogs and afternoon winds, the sunshine is tempered by nature’s air conditioning, allowing the intricate fruit flavors to develop slowly and evenly while preserving the crucial acidity that gives GIFFT Chardonnay a delightful clean, crisp edge. 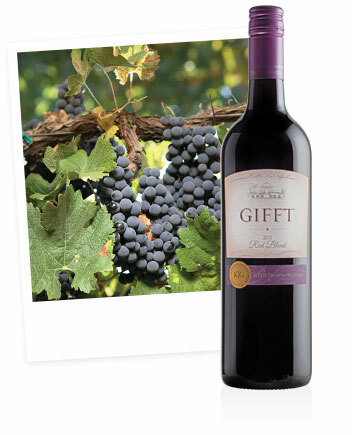 GIFFT Estate Grown Red Blend is sourced from two estate vineyards of Scheid Family Wines in southern Monterey County, located in the sub appellations of San Lucas and Hames Valley. With sunshine-filled days followed by the cooling maritime influence of the Monterey Bay in the late afternoon, these locales can have a 50° temperature swing from mid-morning to nightfall. These conditions allow the grapes to hang on the vine and give GIFFT Red Blend wonderfully complex flavors and intense varietal character. Kathie Lee’s goal from the beginning was to craft wines that are “authentic”. To Kathie Lee and the Scheid family, authenticity is found in staying true to the sense of place that each of our Monterey County estate vineyards displays.